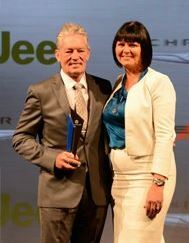 This past Sunday, Fiat Chrysler held their annual awards night at the Crown Promenade Conference Centre honouring dealers from around Australia for excellence in all areas of business. For the second year running John Hughes was named the Chrysler Jeep Dodge National Dealer of the year, riding off the back of another stellar year in sales and customer service. We also picked up the awards for the Western Central 2013 Dealer of the Year award region and Sales Manager Don Jackson came away with the South/West Metro Platinum Wings Trophy. Contact us for our great range of Jeeps, Chryslers and Dodges today.